This is the only cafe in Chennai that has hand crafted bagels and schmears starting INR 120. There is no other cafe in the city that sells so many kinds of bagels at pocket-friendly prices. Munch on bagels, bagelwiches, and melts under INR 200! The bagels are kettle boiled which makes them soft, fluffy and blister-free! We tried their Sesame and Everything Bagel, topped with subtle but creamy Olive Tapenade and Jalapeno Cheddar spreads. The spiced peanut butter spread was mellow and not too spicy. For those with a sweet tooth, we recommend their Chocolate Fudge and Honey Almond spread among others. Wash it all down with a rose milk that has a fluffy, milkshake taste. We liked it nevertheless. Their zingy Galaxy Lemonade is also an interesting drink that comes with Clitoria Ternatea petals! This cafe also has pasta starting INR 180. The Tomato Butter pasta had a smoky feel because of the burnt garlic. So, ask for less garlic if you don't like the aftertaste. They have interesting sandwiches and quick bites too, so check it out! We felt the Aglio-E-Olio was a little too oily, but hey, it’s healthy olive oil! It tasted a bit bland, so ask for veggies or other toppings. From August 7, celebrate Friendship Month with The Bagel Pot! Get a pastry of the day + hot drink for INR 69. Get a mini bagel + cold drink for INR 79. And you can add a wheat brownie to these combos for just INR 30! There are more offers coming too! 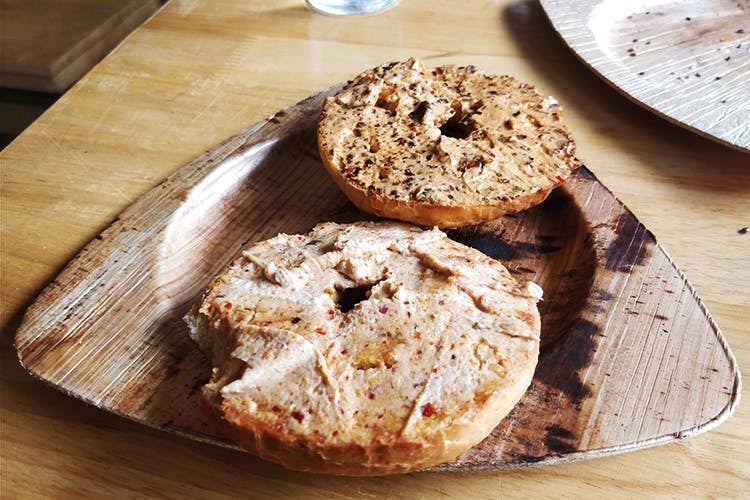 This Bagel Cafe Is Serving The Yummiest Bagels In Town!